to the continental United States. Call for details. Bear Ghost was a Yankton Nakota warrior and leader. The Dakota/Lakota/Nakota people were part of the Sioux nation, each with there own dialect. For them, the sacred Pipe was a way of life. Smoking the Pipe was a part of their meetings to help guide them on the right path. They had many stories about the stars, mother earth and sacred places, believing they originated in the upper northern plains in present day South Dakota and Minnesota.This piece was inspired by photograhs taken by Joseph K. Dixon in 1913. Pow Wow dancers are just amazing to watch! 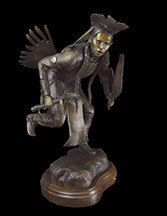 This piece depicts the motion and the expression of a men’s traditional dancer in full regalia. 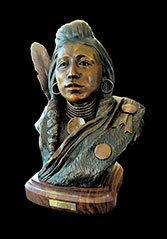 This piece is a portrait of Uriewici, a young Shoshone warrior and chief. The Shoshone were nomadic and inhabited present-day Idaho and Wyoming. This is inspired by photos taken in 1880 by S. George Elsworth. The buffalo was the heart and soul of the plains indians. The buffalo provided food, clothing and shelter, so the Native Americans and the buffalo were both physically and spiritually connected. 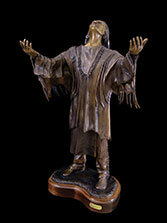 This piece depicts a Cheyenne chief offering a prayer to the Great Spirit for providing for his people. 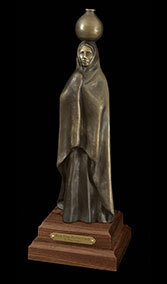 21" x 8" x 6"
This piece depicts the simple beauty and grace of the women’s traditional dance. The gentle bounce of the step and the swaying of the fringe on the dress is a joy to watch. The Women’s Traditional dance has been passed down for generations. 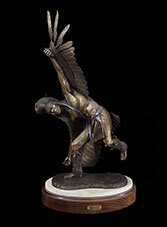 The Eagle Dancer mimics the flight of the eagle as he dances, transporting their prayers to the heavens. For many Native Americans, the eagle is a sacred and symbolic bird because it is able to fly so high and thus move freely between heaven and earth. 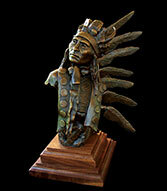 The eagle has always been regarded by Indians as having supernatural powers. 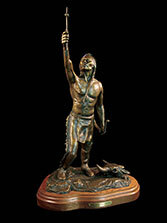 Most tribes grew tobacco, but it always was in small quantities, so smoking the pipe was save for special ceremonies. A warrior would smoke to arrest evil powers, to gain protection from enemies, to bring game closer to the village, or to invoke the blessing of the Great Spirit on anything of importance he was about to undertake. It was believed the smoke carried his wish to the heavens and the Great Spirit. 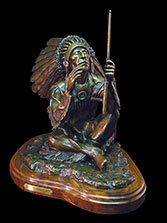 This piece depicts a warrior taking a moment to smoke the pipe before he embarks on a hunt. 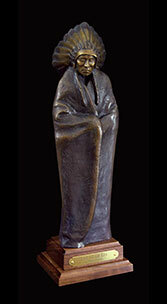 25.5" x 11" x 9"
This piece depicts a Chiricahua Apache sentinel standing guard, protecting his people. The Apache evaded thousands of American and Mexican troops for months, defiantly avoiding being captured and sent to prison. They were one of the last major forces of independent Native American warriors who refused to accept the United States occupation of the American West. A woman sits holding her husband’s shield as she watches him prepare for battle. The shield is his powerful medicine; his protector. He has designed it with great thought and prayer. It is adorned with trade cloth, eagle feathers and a medicine bundle. She holds it, hoping that he returns to her safely and with honor. 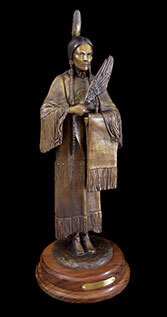 25.5" x 16" x 10"
This piece depicts a Kiowa warrior who is a member of the Bear Society. The Bear Society was created generations ago to show respect for the spirit, bravery and fighting strength of the bear. By carrying his shield adorned with a bear, he gains the same bravery and fighting strength, as well as protective powers. The shield also has trade cloth and eagle feathers, symbols of coups and battle honors. 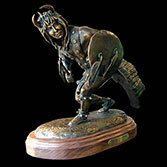 He wears a bear claw necklace to also call on the bear spirit.These warriors were feared and respected by their enemies for the bravery they showed in battle.They were the guardians of the Kiowa. 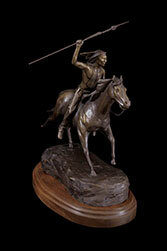 16.5" x 13" x 10"
This piece depicts a warrior riding his horse, his hair and feathers blowing in the wind. His horse is painted with circles around the eyes to give his horse sharp vision, a hand print depicting spiritual power and protection, and lighting bolts on the horse’s flanks. Native Americans believed the Thunder Horse represented the Thunder Beings here on earth. When the Thunder Horse descended from the sky to the mountain tops, his hoofs striking the earth caused thunder. When indians rode, they hoped their horse would take on the power of the Thunder Beings and become Thunder Horses. A Pueblo woman bundles up against the cold as she goes to the stream to get water for her daily chores. The Pueblo women would not only create these pots, but would carry water and grain in them on their heads, showing grace and strength. 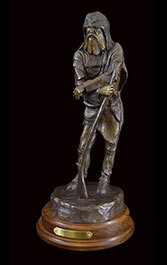 20.5" x 9" x 9"
This piece depicts a mountan man of the early 1800’s, taking a break from checking his trap lines. He spent most of his time in the wilderness of the Rocky Mountains hunting and trapping for furs. 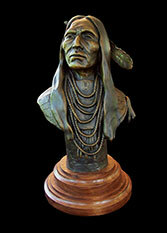 He interacted with Native Americans frequently, trading with them for supplies. He lived a solitary life and depended on his own resources for food and shelter. He carries his powder horn, knives, pouch, etc., and his French musket was his constant companion. 16.5" x 5" x 4"
A Native American elder reflects on his life, his people, his culture... and how everything he has known has come to an end...forever. 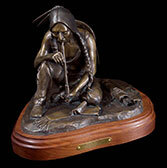 This piece depicts a young warrior on a rocky cliff, looking out over the prairie. Perhaps he’s spotted a herd of buffalo, maybe another group of native americans, or settlers approaching. I wanted this piece to speak to each individual in their own way, so they can interpret what he sees. 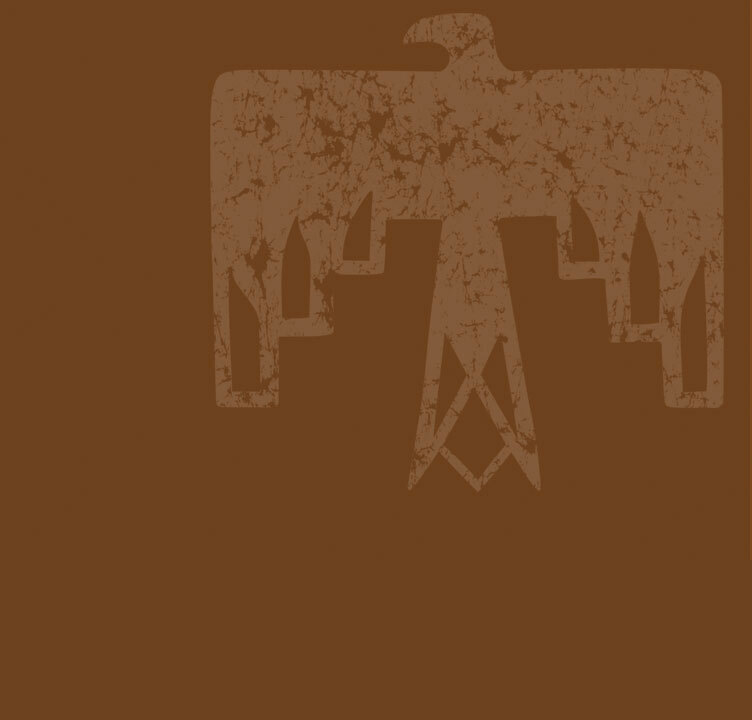 Lone Flag was an Atsina (Gros Ventre), a tribe found in northern Montana. 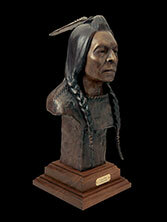 He was born in 1854, and at a young age, he participated in his first battle with their ongoing enemies, the Piegan. He was said to have captured a medicine bundle from that battle, getting his first battle honor. This piece was inspired by a photo taken of Lone Flag by Edward Curtis in 1908. 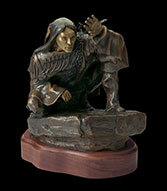 38" x 20" x 18"
This piece depicts a Lakota warrior on a vision quest. A traditional Native American vision quest consists of a person spending one to four days and nights secluded in nature, usually at the top of a hill or butte. They typically will fast and not sleep for the duration of their quest.This provides time for deep communion with the great spirit and a search for self-identity. During this time of intense spiritual communication a person can receive profound insight into themselves and the world. This insight, typically in the form of a dream or vision, relates directly to their purpose and destiny in life. They would council with the medicine man after their quest, and he would interpret their vision to give them direction for their destiny. 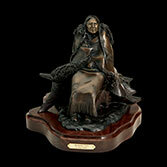 This piece depicts a Lakota woman, snuggled up in a buffalo robe, basking in the morning sun. She’s fighting off the morning chill before heading to the stream to fetch water and start her daily routine... just a moment to herself, one of life’s simple pleasures. 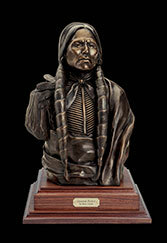 19" x 12" x 10.5"
Quanah Parker was the son of Comanche chief Peta Nocona and Cynthia Ann Parker, who was kidnapped by the Comanche as a young girl. When he was a young teenager, he was orphaned when soldiers raided their camp. His father was killed and his mother and younger sister were taken from him back to white settlements. He ended up taking refuge with the Quahada Comanches, the most warlike of all the Comanche bands. He became an accomplished horseman, and a well respected warrior and leader. He was a major figure in helping put a stop to western expansion for well over a decade. Due to the depletion of the buffalo, his people were resigned to surrendering in 1875. Quanah was able to embrace the white man’s world, and became the leader and spokesman for all Comanches, promoting ranching, education for the children, and self-sufficiency. settlers as the Apaches did throughout their existence. The Mescalero roamed freely throughout the Southwest including Texas, Arizona, Chihuahua and Sonora, México.Their survival was dependant on constant vigilance, keeping a watchful eye out for their enemies. 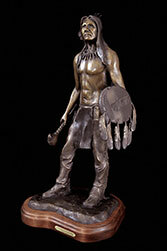 29" x 13" x 10"
This piece depicts a Lakota warrior shortly after a battle, where he's claimed a battlefield souvenir; a calvary first sergeant's jacket. His war club is fashioned from a discarded rifle stock, which he has embelished with brass tacks and rawhide strips. 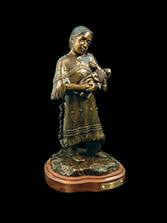 13.5" x 7" x 6"
This shows a young Lakota girl who's just received a doll from her grandmother. The grandmother would lovingly make a doll from deerskin and adorn it with beadwork and horsehair. The doll would become a very prized possession for the young girl. 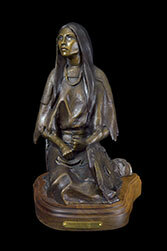 This piece was inspired by a 1898 photo taken of Katie (Mourning Dove) Roubideaux by photographer John A. Anderson. 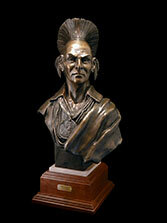 30" x 15" x 13"
Black Hawk was a leader and warrior of the Sauk Indians. 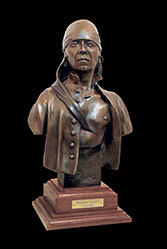 He was born in the village of Saukenuk on the Rock River, in present-day Rock Island, Illinois, in 1767. The Sauk people used the village in the summer for raising corn and as a burial site, while moving across the Mississippi for winter hunts and fur trapping. Black Hawk fought on the side of the British during the War of 1812. He achieved status through his exploits as a warrior, and by leading successful raiding parties. Although he is referred to as “Chief”, in actuality he was a “war leader”, which means he wielded different powers than a civil chief. 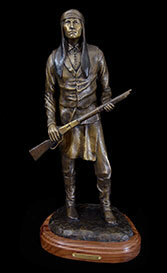 He later led a band of Sauk and Fox warriors, known as the British Band, against European-American settlers in present-day Illinois and Wisconsin in the 1832 Black Hawk War. After the war, he was captured and taken to the eastern U.S., where he and other leaders toured several cities. Black Hawk died in 1838 in what is now southeastern Iowa. This piece is inspired by an 1837 painting by Charles Bird King. The elite Akicita Warrior Society painted the sacred buffalo skull with this Camp Circle design as a sign of authority and protection for the annual gathering of the seven councils of the Sioux nation (Mdewkanton, Wahpekute, Wahpeton, Sisseton, Yankton, Yanktonay and Teton). Each triangle represents the encampment of each group. Buffalo skulls were central to sacred rites performed my many Native American tribes and designs varied because they were derived from dream visions. 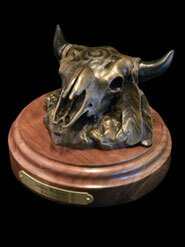 17" x 8" x 7"
Slim was inspired by a cowboy working a horse ranch in Arizona. Quiet, hard working...the epitome of today’s coyboy. He was definitely the real deal. 13" x 7.5" x 5"
Scorched Lightning, Miniconjou, was a noted warrior with Spotted Eagle’s band and was said to have counted many coups. He most likely fought alongside Spotted Eagle in the Battle of Little Big Horn. This peice was inspire by a photo taken by L.A. Huffman in 1880. 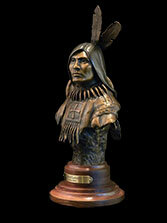 36 " x 14" x 12"
This piece was done at the request of Jim Yellowhawk, to honor his grandfather. 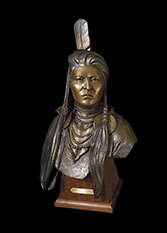 Yellow Hawk, Sans Arc Sioux, was a well respected warrior who became an advocate for his people. 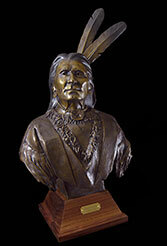 He was part of the Sioux delegation to visit the Capital in Washington D.C. in 1867. This piece was inspired by photographs taken by A. Zeno Shindler. 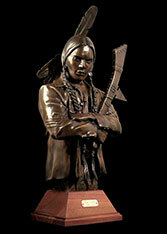 Double Runner was a respected warrior of the Piegan, the southermost tribe of the Blackfoot. They roamed through the Rocky Mountains on the south side of Marias River of Montana and along both banks of the Missouri River. They were known for their beautiful craftwork designs in their tepees, clothing, weapons and riding equipment. They depended on the buffalo for many things. In the spring, when the buffalo moved out onto the grasslands, the Blackfoot followed. They lived in large tribal camps, hunting buffalo and engaging in ceremonial rituals. In mid-summer, the people gathered for a major tribal ceremony, the Sun Dance. This gathering was not only social, but allowed them to participate in their rituals and to induct members into their warrior societies. This peice was inspire by a photo taken by Edward Curtis in 1900. 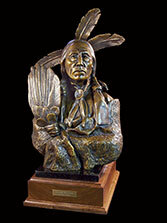 18" x 10" x 13"
Little is written regarding Little Horse, Oglala, but it is believed he participated in the battle of Little Bighorn, fighting along side Crazy Horse and Sitting Bull. 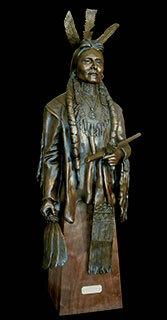 The Oglala Sioux roamed the plains between the north and south forks of Platte river and west of the Black Hills. They occupied the country extending northeast from Fort Laramie, at the mouth of Laramie River on North Platte River, including the Black Hills and the sources of Bad River and reaching to the fork of the Cheyenne, and ranged as far west as the head of Grand River. This piece was inspired by photos taken by Herman Heyn in 1898. 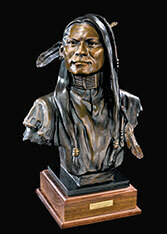 18 " x 13" x 18"
Red Hawk, Oglala, went on his first war party at the age of eleven. 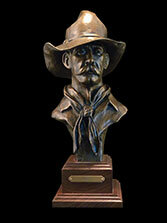 He eventually participated in twenty battles, including the battle against Custer at the Little Bighorn in 1876. He fasted twice. The second time, after two days and a night, he had a vision of four women mourning as they circled the camp, followed by a warrior singing the death song. His grandfather then appeared to him and told him to arise. With that, he awoke. He looked eastward and saw the sun peeping above the horizon so he took his pipe and held it to the rising sun as he offered a prayer, “Let my people with glad hearts behold a good day.” Unfortunately, a few days later, four men were killed in a raid, and their wifes circled the camp mourning, while the survivor of the battle followed them, singing the death song. This piece was inspired by accounts and photos taken by Edward Curtis, 1907. 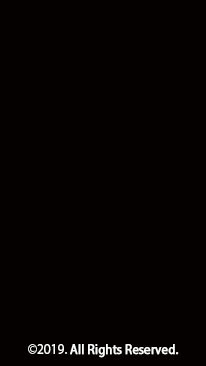 Sitting Elk, Absaroke, takes an oath that the following account is true. In Absaroke tradition, a warrior would cut a piece of buffalo meat on top of a buffalo skull. He would pierce the meat with an arrow and present it to the sun. He would then touch the meat to his lips, swearing that his words were the truth. 26" x 13" x 12.5"
Struck By Crow, Oglala, was a well respected warrior and participated in ten battles, including the Battle at Little Bighorn. His first battle was at the age of eleven. He counted coup twice in one battle against the Flathead. His vision quest had him fasting four different times. For one fast, he took buffalo skins to a summit to present to the Great Spirit. After standing until well after dark, he saw a vision of many white horses coming over a ridge toward a fork in the river. A short time later, on a raiding party, he and his companions captured many horses, including several white ones. This piece was inspired by a 1907 photo taken by Edward Curtis. "Last Dance for Iron Breast"
Iron Breast, Piegan, dances for the last time with the Society of Bulls. The society was an organization of older Piegan men who gathered to celebrate by depicting the movement of the buffalo during a hunt. The Society of Bulls disbanded after one member fell during the dance, got up to follow the others, but in a short period of time died. This caused the remaining members to regard the dance with suspicion, and it was never repeated. 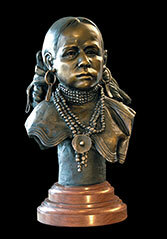 The Jicarilla were a relatively small group in northern New Mexico, with their own ceremonies, dances and rituals. The young girls and women traditionally wore deerskin capes decorated with beading, and tied their hair up with large pieces of trade cloth. Although somewhat influenced by other tribes, they lived an isolated life, keeping there traditions and innocence alive for most of the 19th century. This piece was inspired by a 1904 photo taken by Edward Curtis. 14.5" x 11" x 9"
Kashhila (Wishham) was a young boy in his teens when Edward Curtis took his photo in 1909. The Wishham inhabited the northern bank of the Columbia River in what is today's Washington State. They were expert fishermen and basket weavers Their numbers were few, and had close ties to the Nez Perce, Yakima and Wallawalla Indians. 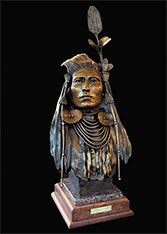 31.5 " x 12" x 9"
Medicine Crow, Absaroke, was a warrior that survived many battles. He was known for his visions of the future, one of which was the eventual demise of the buffalo and the coming of the white man. He traveled to Washington many times on behalf of his people as these visions came to pass. This piece was inspired by a photo by Charles Bell when Medicine Crow was a young man of 32. 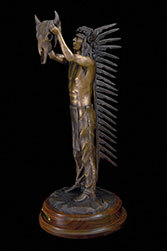 24" x 16" x 10.5"
Red Armed Panther, a distinguished Cheyenne warrior and hunter, scouted for General Nelson Miles during the 1877 Nez Perce campaign. This piece was inspired by a photograph by L. A. Huffman taken in 1879. 20" x 15" x 11"
This piece was inspired by a 1907 photograph by Edward Curtis. Slow Bull (Oglala) went on his first war party at fourteen, captured one hundred and seventy horses from the Apsaroke at seventeen and went on to participate in over fifty battles. 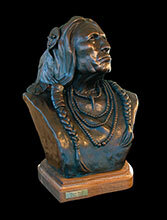 He was considered to be one of the great Sioux warriors. ** Availability subject to change. If a piece has to be cast, please allow 14 weeks.